Wash drawing by Murugesa Moodaliar of a carved domed slab and a fragment of railing coping from the Great Stupa of Amaravati. This is one of 42 sheets (89 drawings) depicting sculpture from Amaravati and S. India. Inscribed with numbers 2 to 90 (1 is missing) and with measurements; signed:' P. Mooroogasa Moodr', dated c.1853. 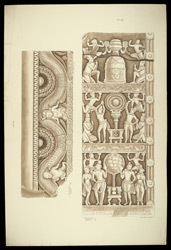 The drawing No.37 depicts the reliefs on a domed slab carved in three registers. Thes scenes depict, from the bottom: the Enlightment of the Buddha or nirvana, symbolised by the Bodhi Tree; the First Sermon of the Buddha in the Deer Park at Sarnath represented by the dharmacakra wheel or Wheel of the Law; the Death of the Buddha (mahaparinirvana) symbolised by the stupa. This fine relief is assigned to the first phase of the High Period at Amaravati, 2nd century AD. The drawing No.38 depicts a fragment of an early example of rail coping dated 1st century BC. The relief is carved with a thick garland held up by dwarfs and with half-lotus roundels.